On one of his district tours to Chumur, Deputy Commissioner of Leh, G. Prasanna Ramaswamy IAS, noticed the women knitting beautiful garments for their family. This was when this idea stuck him to hone the women’s innate skills along with introducing weaving, so that they make marketable products. His wife Abhilasha Bahuguna and he had also discussed promoting Pashmina products during courtship when on many of their exhibition visits they were surprised on not finding Changthang Ladakh pashmina sellers when it is the source region. Everybody else was selling Pashmina and everything under the brand name using the cooked up marketing tactic of fabled Pashmina shawl that can pass through a ring when genuine fabric cannot pass through a ring. So they strategized and worked together on Project Laksal to create the brand Looms of Ladakh. 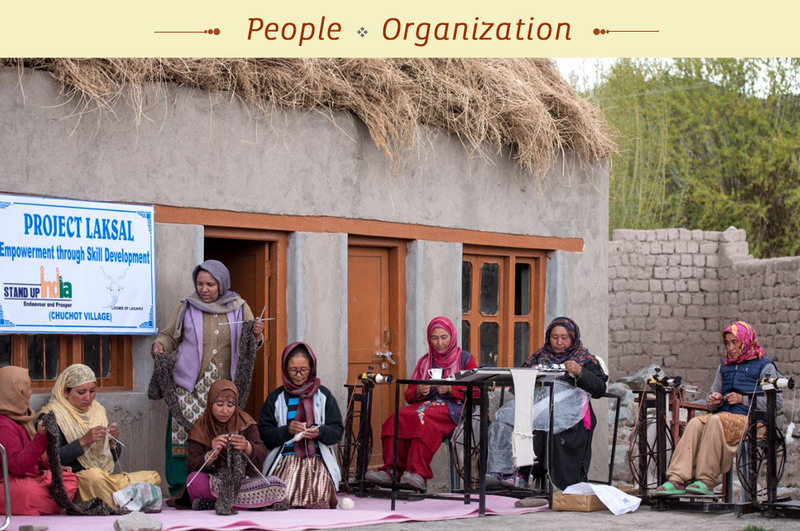 Other likeminded and dedicated officers and individuals joined hands to contribute in the success story of Looms of Ladakh Women Cooperative. 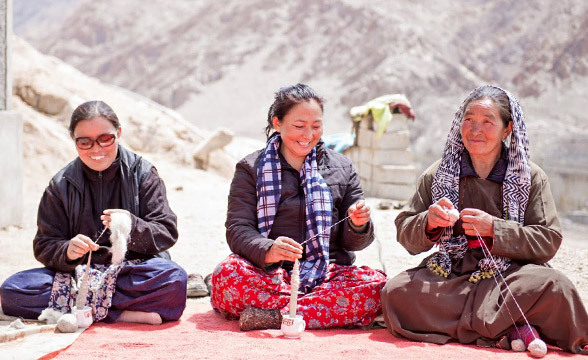 With a clear vision in front of them they aimed to establish sustainable Pashmina, Bactrian camel and Yak wool small scale industry with responsible environment impact in Ladakh. This was much needed so that the locals can remarkably benefit from their own ecosystem; this high end raw material comes from. 1. 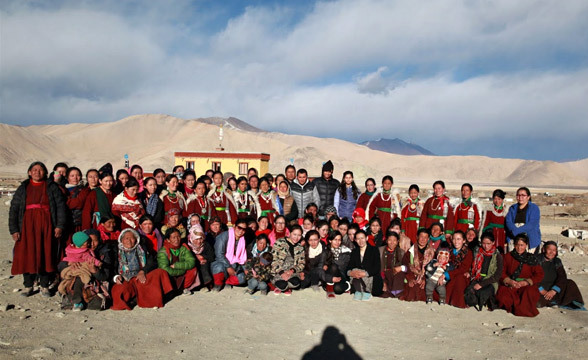 Skill development- It was observed that most of the villages in Leh have women’s alliances (Ama Tsogspa in Ladakhi) whose members have managed to organize themselves into very small scale production units. These women’s groups produce coarse woolen and Pashmina products, whose market is mainly locals and visiting tourists. Apart from small scale economic activities these groups also act as pressure groups for reinforcing traditional values and opposing activities considered as modern threats, for example, drinking of non-local alcoholic beverages. These women have the basic skills required to produce crude hand-knit and hand- woven woolen and Pashmina products. Thus, one of the main objectives of the project is to impart refined skills to these women and also orient the products towards current market trends. Spinning, knitting, weaving and most importantly designing with emphasis on finesse is taught at the centre. The other skills imparted are basic communication in English, computer handling and coordination. It is envisaged that these skills will enhance their income earning capacity and provide a viable and sustainable source of livelihood. 2. 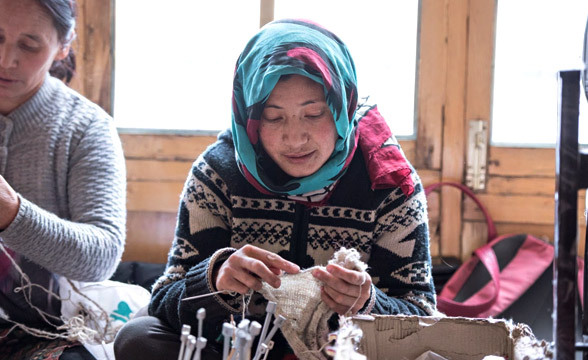 Organization- There is a shortage of a skilled, organized workforce in Ladakh to realize the true potential of the locally available raw materials. This was evidenced from the fact that there were very few local producers and marketers of Pashmina and woolen products. The individual village based women’s alliances are very small in size and there is negligible interaction and viable cooperation between the alliances of different villages. Thus the project also intends to create an organized workforce of skilled women capable of producing and marketing their products directly through regular interactions. 3. 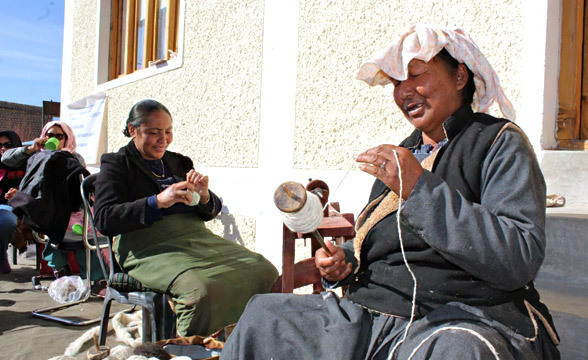 Enhancement of income earning potential- It was observed that despite possessing some basic skills and enjoying access to quality raw material, the Pashmina sector has not been a viable source of livelihood to women in Ladakhi villages. 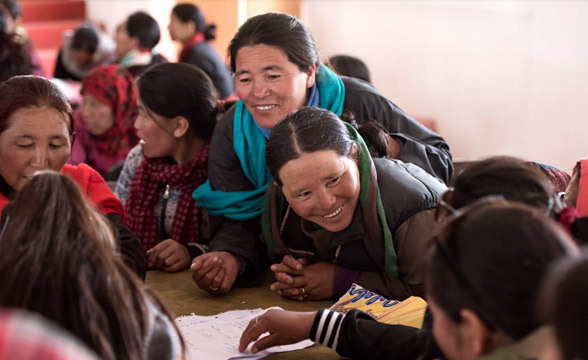 For example, the women in Chumur and Kargyam villages were found to prefer working as unskilled laborers in road construction to weaving or knitting activities. Consequentially these women fail to realize the immense potential of the market for handmade Pashmina and woolen products and engage in less productive vocations. 4. Demonstration- There were no women organizations in Leh engaged in professional production and marketing of woolen and Pashmina products. There is a commonly held perception that Ladakh is and can only be a producer of raw Pashmina and does not have the comparative advantage in the production of finished goods. 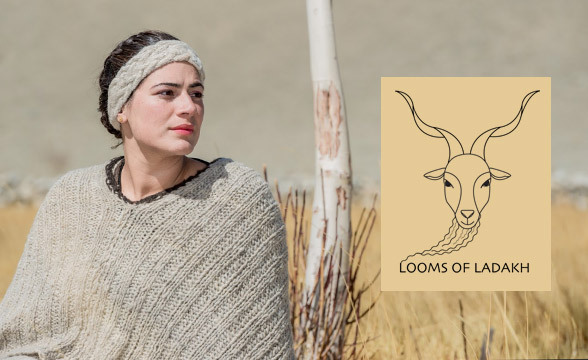 One of the objectives of this project became to demonstrate that organized production and marketing of woolen handloom products can be a viable industry providing livelihood to women in remote locations of Leh. It is anticipated that the success of this project will induce other women groups/alliances to seriously consider and engage in this sector bringing about positive changes in their lives and communities. 5. Women empowerment- Leh’s women have been in a comfortable social and family position in the past. A typical Ladakhi family used to hold its females in relatively high esteem and this was reflected in practices like polyandry (reportedly still in vogue in some remote areas). However, in recent times the position of women has been relegated relatively insignificant due to factors mentioned earlier. One of the reasons for such state of affairs is the lack of employment opportunities for women at par with men in rural Ladakh. This project targets a sector that has reach in most of the villages in Ladakh and can affect the lives of hundreds of unemployed women. When the earning power of women increases, their say in the affairs of the family and their community will also increase. This project seeks to create a successful example of empowering women through simple solutions tapping into their innate potentials and spirit. 6. Checking migration- The village of Kharnak does not exist anymore, not in any real sense anyways. Its residents migrated from the vastnesses of Changthang to the suburbs of Leh not so long back where it assumed its new form as Kharnakling. Kharnak is just a dramatic manifestation of a phenomenon underway in Ladakh in recent times due to the onslaught of modernity. Individuals, families and societies are abandoning their age old ways of life and occupations to migrate to Leh and other urban areas. Both push and pull factors are responsible for this migration and the pull more often turns out to be a mirage. Lack of income earning opportunities commensurate with modern expectations and comforts, acting as a real push factor driving these communities to outskirts of Leh, in localities like Skampari and Choglamsar. But the real threat is the potential loss of a way of life and over burden on the urban infrastructure of Leh. This project seeks to provide employment to rural women and their families in their villages exploiting their local resources and their talents. Changthang region produces 450 quintal of Pashmina every year. 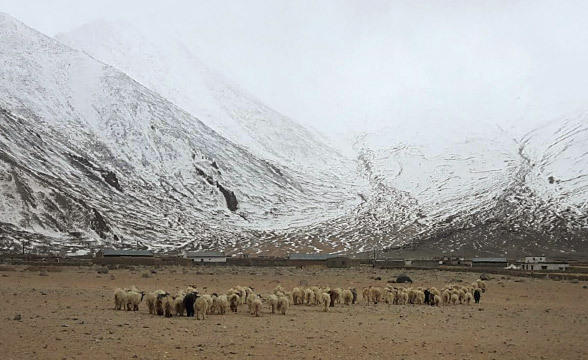 There are more than 2000 nomadic households directly engaged in livestock rearing in Ladakh. Most of it is sold outside through traders who convert it into machine made finished goods. In Ladakh, value addition in Pashmina for bigger markets has never happened before. This is the first such effort to convert available raw material into finished products on such a big scale. In the Pashmina trade, most of the value is locked up at the higher level. At the bottom of the value chain, cost of raw material is Rs.2100 per kg. One goat produces 250g raw material per year. The earning that the nomad gets after rearing the goat throughout the year is negligible. Whereas a shawl made from 75-100g can fetch more than Rs.15000 in the market. Through this initiative, women’s Cooperative was able to convert 8 quintals of raw material into finished products. This is the beginning. We are hopeful that more communities will join this movement and by next year they will be able to add value to more quintals. Also, last year the cost of pashm after dehairing was Rs.7600 per kg. This year it is Rs.7000 per kg. Price is determined by international market based on production in Mongolia, China and Ladakh and the international demand. There is price fluctuation. So by adding value to a part of Pashmina raw material, the risk of Pashmina growers is hedged. The project aims to bring the Pashmina growers under the ambit of the umbrella brand ‘Looms of Ladakh’ with each production year by Peer Learning. The villages of Stok, Chuchot, Phyang and Kharnak were trained first as part of the pilot project and the villages of Chushul, Merak, Parma and Sato which are on the Chinese border in the second Phase. Kharnakling was chosen because it is a congested urban slum near Leh whose residents are migrants of Kharnak village in Changthang. Their products were displayed for the first time at Tourist Information Centre, Leh outlet and an encouraging response was instrumental in building confidence. Without any marketing background these women saw how value addition in true sense gathers positive response and drives sales. Phase II started in the harsh winters of ladakh, in Chushot and Phyang, where women were trained for three most crucial months. Saton, Barma, Merak and Chushul were trained after that. 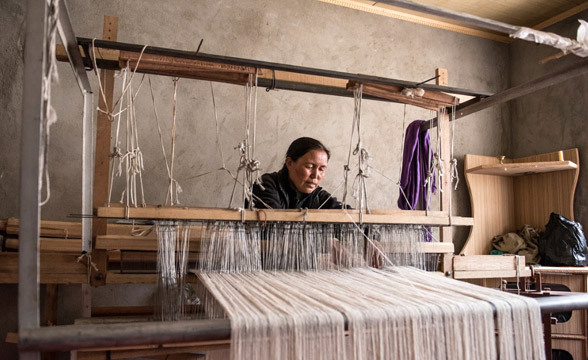 Ladakh’s Pashmina Products should cater to a niche domestic and international market, which demands genuine, elegant but simple designs, playing with patterns and organic colors. Shawls, Stoles, Knitwear Apparels – both Avant-garde and casual, luxury home furnishing – Namdas (rugs), Pashmina and yak wool tweed fabric and other products that can be made by felting eg. Pashmina felt toys as souvenirs will be produced in near future. A total of 150 women have benefitted from the project so far. As part of the training, individual communities were provided with; Master trainers to teach the intricacies of designing apparel, Raw material to work with, Equipments, tools and machines, A retail outlet in one of the most prominent places for the sale of their products, Organizational and financial training in collaboration with State Bank of India. The Cooperative is owned and run by the women themselves. They have elected their own CEO/Secretary, Treasurer, Team Leaders for Marketing, Design, Production & Procurement for a term of two years. At the end of each month, 38 per cent of proceeds from sales are transferred to the village producer groups and the rest goes in remunerations and other recurring costs. A percentage is kept aside as Welfare fund which is again run by a local Committee to give out loans for medical and educational needs of the member families. The welfare loan also ensures a feeling of belonging and sisterhood among the members. Project Laksal has been implemented till now through Project Budget sanctioned by Deputy Commissioner’s Office and funds from the District Sheep Husbandry Department which have been utilized in one production year and now the women entrepreneurs have taken up the functioning of the cooperative. The efforts of Dr. Tundup Namgyal, Shri Tatpar Joldan, Dr. Iftikhar Hussein, Dr. Niyaz-al-Hassanain, Shri Tashi Paldan, Shri Tsewang Dorjay and councillor of Changthang Ladakh are commendable. Everybody went out of their way and mandate to implement this initiative.